No visit to Istanbul would be complete without hearing some live Turkish music. The best location for live music in Istanbul is unquestionably the Taksim area, but more specifically Istiklal Street. This long pedestrian boulevard starts at Taksim Revolutionary Square and ends at the Tunel where Istanbul’s historic funicular is located. All along Istiklal on any given night of the week the bars will be certain to have at the very least a singer with their guitar belting out popular Turkish tunes. Some, not so well. For a guaranteed good show here is a list of venues I would suggest. 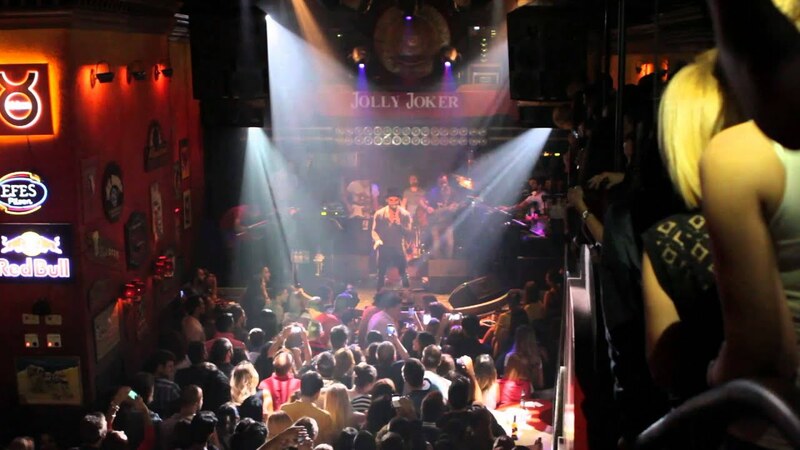 Jolly Joker is one of Istanbul’s top venues. Located just off Istiklal its primary focus is big name musicians that have a large draw. This would be the place to check out artists you may hear on the radio but in a fairly intimate setting. Its open floor plan means come early if you want to be close to the stage. If not you will be relegated to the back room where video screens are set up. This room can be nice in the summer as it has a retractable roof. Non-smokers beware it can get smokey on a crowded night. Which is pretty much every night. Front room is smoke free. I would recommend buying tickets in advance for most shows. If you are looking for a venue to hear a wide variety of artists, Babylon is unquestionably where you want to be. On any given night the music can range from jazz to techno or rock with every genre in between. They have a reputation for hosting interesting foreign acts touring from Europe. I have seen some pretty avant garde shows there, to say the least. It’s kind of a musical roulette. But I have never been let down. Located just off the Tunel it’s in a cool party of Istiklal and worth checking out. Also just off of Istiklal, Mask is known for hosting up and coming acts; so, don’t miss out on the opportunity to say you knew the band before they were famous. It’s a small venue but very tastefully done with exposed brick walls and thoughtful adornments. They also host a wide genre of artists. I recently attended a heavy metal concert there, which was somewhat surreal, but fun! The majority of the bands are Turkish but they do on occasion have foreign acts on their calendar as well as long time artists. The monthly line up can be located here. It’s a great club to just go and hear good music in a low key and casual setting. Hayal Kahvesi is another beautiful venue that hosts rising musicians covering a broad span of genres. They also sometimes have foreign bands on their calendar and more well established musicians. This is the place that is sort of ‘the scene’ where you would probably get a glance at well known musician or actor. There is a little bit of that vibe. But don’t let that put you off. Any night is a good night to go, but this might be the venue to go out for dinner and drinks and make a weekend night of it. Seeing and being seen. Of all the venues on the list, this is the one that qualifies as a club. Line has an interesting set up. They have a stage which live bands perform cover songs, often doing English covers as well as Turkish. But then during set breaks it becomes a dance club with American pop and hip hop songs playing. So you get a mix of live music and dance music. Which can be fun. It’s a younger crowd, although certainly all ages are represented. This is the place to go for a little bit more of a wild time and if that’s your poison you are in luck, it’s a 5 a.m. bar. Each of these establishments have their defining characteristics which set them apart from the others. But all of them offer solid lines ups and very reasonable cover charges, even for the big acts. The experience will be certain to be a memorable one. This article was originally published on Circle Istanbul, then re-posted on Atdaa with author's permission.